Unlike gun crime, it is difficult to stop the supply of knives. I go into my kitchen and there are a number of potentially lethal weapons kept there. I would hope that none of my kids would go out with one. “With the availability of knives, it’s about making people – in particular young people – aware that carrying a knife, or using a knife in violent circumstances has enormous consequences. The number 1 reason for young people carrying knives is fear we must make our youth feel secure..
Reported knife crime has seen a 21 per cent year-on-year spike across England and Wales, new figures show. Forces registered 37,443 offences involving a knife or sharp instrument in the year ending September 2017 – the highest tally since comparable records started in the 12 months to March 2011. The “shocking” statistics came as police numbers over the same 12 months hit historic lows. We are trying to reverse the trend in our community. We can provide training to individuals and groups based on awareness and defensive tactics. Possession of a knife carries a prison sentence of up to 5 years even if it’s not used. 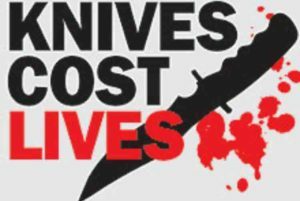 If you are caught with a knife it doesn’t matter if it was for your own protection or you were carrying it for someone else – you will be arrested and prosecuted. Self-protection is not a reasonable excuse for carrying an offensive weapon. The legal definition of an offensive weapon includes anything intended to be used to harm another person, like a sharpened comb. It’s also illegal to carry a ‘disguised knife’ – anything with a concealed blade or sharp point that’s made to look like an everyday object (like a pen, cigarette lighter or lipstick). There is no ‘safe place’ to stab someone. Get stabbed in the heart and you can lose all of your blood in one minute. But a wound in the arm or the leg can still kill and young people have died from wounds to the leg because an artery was severed. Knife crime can affect anyone, not just people in gangs. Innocent bystanders can get caught in the middle of other people’s disputes and suffer trauma, serious injuries or worse. Knife crime is falling in Scotland, fewer people are carrying knives and doing so is becoming less and less acceptable among young people. Police can – and do – stop and search anyone they think is carrying a weapon. It’s illegal to carry a knife or offensive weapon in a public place without a reasonable excuse. Reasonable excuses include those who need them for work, like fishermen or carpet fitters, but this only applies while they’re actually at work. Even if it’s not you who does it, if someone is injured or killed by a knife in your presence you could be sent to prison for murder or attempted murder in what is referred to as ‘joint enterprise’. It’s illegal for shops to sell knives to anyone under 18 and buying a knife under the age of 18 is an offence. This includes kitchen knives and even cutlery. By carrying a knife, you are much more likely to get stabbed yourself as situations involving weapons can quickly get out of control. Knives are the most common weapons used in killings of young people. If you have a criminal record you might not be accepted into a college or university, get a job, or travel to some countries, like the USA, Canada or Australia. Copyright © 2019 Redditch Self Defence . All Rights Reserved.